Between Sanremo and Albenga are around 70 kilometers of lovely Riviera coastline. Following the traces of the old Roman road that skirts the sea, the visitor crosses the capital of the Province of Imperia, many summer sea resorts, medieval old towns, and heading towards the mountains, some of the valleys and plains known for their agriculture. A weekend spent among the olive groves on the sea, with excursions for those who love history, and for those who enjoy gastronomy and special unique local dishes. 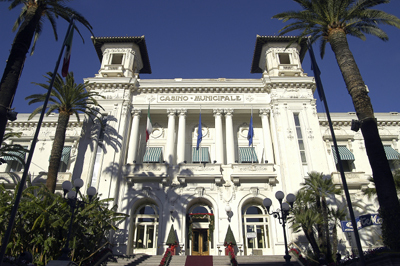 Sanremo is famous for its flower-growing – hence its nickname, The City of Flowers – and for the Festival of Italian Song, held here each year since 1951. Sanremo lies on a wide bay between Capo Nero (Cape Black) and Capo Verde (Cape Green). The oldest part of town dates to the Middle Ages and is known as the “Pigna”. Here you will find houses clustered on rocky slopes, steep alleyways, and tiny piazzas. The modern city is an elegant tourist center that is animated by many events, and well-loved by gamblers, roulette and slot-machine fans at the Municipal Casino located in a splendid Art Nouveau building dating to 1905. Beyond Sanremo heading east is the lovely fishing village of Bussana, followed by Taggia and the mouth of the Valle Argentina. Taggia, which gives its name to the typical olive of Liguria – small, black, and slightly bitter Taggiasche olives – is worth a stop. Go for a swim (the waters here have been awarded the coveted Blue Flag) or a walk in the old town, which is Liguria’s second largest, by area and importance, after Genoa’s. In the lands behind the sea, our route takes us to many mountain villages straight out of the Middle Ages. Perfectly preserved Badalucco is an example, where every year the Festival to Dried Codfish, "Sagra dello stoccafisso” is held. In Montalto you can admire the 14th Century frescoes in the romanrsque Church of San Giorgio. And if you continue on the road, Triora holds a particular fascination. The site of major witch trials four centuries ago, Triora’s dark alleyways, piazzas, courtyards, ramps of public stairways, and sculptured portals all give it a special atmosphere, perched on its spur of rock in a panoramic position. Gourmets will love the bread, “pane di Triora”, and history and sorcery lovers, the Museum of Witchcraft, Museo della Stregoneria. Or enjoy the coast of the Mediterranean on the old Roman road, the Aurelia, as it crosses Riviera towns. On weekends in the summer traffic may be heavy, but the panoramic vistas brook no equal. Riviera towns Santo Stefano al mare, San Lorenzo al Mare, Imperia, Diano Marina, San Bartolomeo, Andora, Laigueglia and Alassio, each are worth a stop, or a visit, or a swim. Liguria’s steep mountains rise out of the sea. This is why so many of the olive groves are on layered terraces held up by “dry” stone walls (without the use of mortar – to allow water to pass through). Liguria’s particular Taggiasche olive production dates to the Middle Ages, when Benedictine monks bred this new variety out of a series of genetic crosses. The “new” type of olive spread across the land, and terracing techniques were refined to increase arable area. Today Liguria specializes in taggiasche, lavagnine, and pignole olives, along with other local species all pressed at their own mill. Ligurian olive oil is low in acidity, has a slightly fruity tendency, and a sweetness that exalts the characteristics of foods without intervening too decisively. Quality and origin are guaranteed by the consortium, Consorzio di Tutela dell’Olio Extra-vergine di Oliva Riviera Ligure DOP, as well as the production techniques used for each brand bearing its seal. The Valle Arroscia, in the mountains behind Imperia, is rich in olive groves, as well as chestnut and beech woods. It is ideal for a restful break at the height of the summer heat, with a beautiful view of the sea in the distance. Among the best known towns that delight gourmets, at around 30 kilometers from Imperia is the village of Vessalico, known for its heirloom garlic, small in size and pink in color. For several years now a local cooperative has been working on recovering production of this unusual variety of garlic which is very aromatic, but easy to digest. Continuing along the coast, we pass the Island of Gallinara, a protected nature reserve, to then reach Albenga. The town is sited on a fertile plain that extends around it to the north, unique in this region of mountains on the sea. 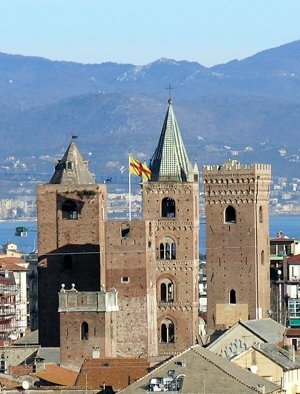 Albenga has a very picturesque and well-conserved old town, which is for the great part surrounded by city walls in stone. Peeking above it are many towers, palaces, and other interesting architecture from the Middle Ages. The fertile plain of Albenga has been cultivated since Roman times, and is the most important agricultural zone in the whole of Liguria. It also has its own special heirloom vegetables like the violet asparagus, the blue-hearted tomato, the spiny artichoke, and trumpet squash (you must try it!). But all the other typical Italian vegetables are also grown here, along with fruit, like peaches and apricots, not to mention basil and other aromatic herbs. The weekly market is held on Wednesdays on Via Dalmazia and the surrounding streets, and there are many fairs and markets held during the year to promote the best in local production. From the plain of Albenga roads lead to four different valleys. Following the River Neva, takes you to Cisano and the Castle of Conscente to reach the picturesque village of Zuccarello with its ancient porticos, and then to the crossroads to Castelvecchio di Rocca Barbena, where the houses built in stone date to the XI Century, in the shadow of the Tower Rook Barbena, which gives its name to this lovely village.